The interpreter sits in a booth with a clear view of the meeting room and the speaker and listens to and simultaneously interprets the speech into a target language. 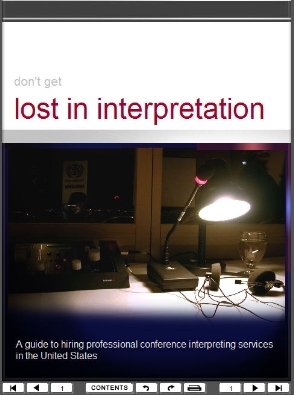 Simultaneous interpreting requires a booth (fixed or mobile) that meets ISO standards of acoustic isolation, dimensions, air quality and accessibility as well as appropriate equipment (headphones, microphones). The interpreter sits at the same table with the delegates or at the speaker’s platform and interprets a speech into the target language after the speaker speaks. The length of the speeches varies. For this purpose the interpreter may take notes. The interpreter is seated next to one or two meeting participants and whispers the interpretation of the speech.